Save the dates for Twin Cities Veg Fest 2016! On Monday, April 6, we held our first-ever Town Hall meeting. Twenty people came to share their thoughts and feedback about our work. We greatly appreciate their time and input. We talked about CAA’s existing programs, asked attendees to pick the programs they thought were most important, and asked them provide us with anonymous feedback on what we could do better. We also had an open discussion on CAA’s work and future plans. The programs that attendees thought were most important were community-building events, Bridges of Respect, Twin Cities Veg Fest, volunteer training, and research. We also had a number of suggestions for new activities and things we could do better. Several people were interested in having more social events that weren’t entirely food-focused, such as athletic outings and game nights. We also talked about the barriers to reaching out to a broader group of people. How can we do better at reaching out to people from more diverse economic and racial backgrounds than the bulk of our current volunteers and supporters? There was a lot of other feedback and discussion, all of which will be shared with our Board of Directors. Of course, the best way to improve what we’re doing is by helping us do it. Do you have an idea for a new program or campaign, or thoughts on how to improve what we’re doing? We’re always excited to support new volunteer leaders. Check out our list of volunteer opportunities and fill out our volunteer form today! Compassionate Action for Animals launched our conference, Their Lives, Our Voices (TLOV), in 2008. 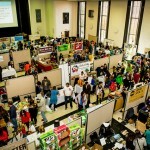 The conference ran through 2010, then went on hiatus until we hosted it in conjunction with Twin Cities Veg Fest in 2013 and 2014. We have decided to discontinue TLOV in 2015, but we have plans for other programs that will offer resources for activists. There have always been two motivations for hosting TLOV. 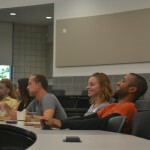 First, we wanted to bring together animal advocates from across the Midwest to form connections and exchange ideas. As a bonus, we had national figures in the animal advocacy movement participating. However, it was always the networking between activists in the region that has been most important feature of this event for us. We think that Twin Cities Veg Fest can fulfill that purpose just as well since it also attracts advocates from around the region. With this in mind, we will add space and time for networking at our next Twin Cities Veg Fest. Our other goal for TLOV has been to provide practical training for animal advocates, especially for those who volunteer for CAA. This training has included sessions on leafleting, responding to frequently asked questions, fundraising, organizing events, public speaking, and more. We will continue to offer this sort of education to our volunteers through training sessions that will be scheduled throughout the year. Since these sessions will require less planning and resources to produce than TLOV, they can happen more often and will be free to attend. An added advantage is that the Twin Cities Veg Fest planning committee can focus on improving the festival, rather than also planning for TLOV. Our first training session is coming up on Saturday, February 21, from 10am to 5pm. We’ll cover a variety of topics, including a basic overview of CAA, humane education presentations, and other activities. We’ll also provide a free vegan lunch as part of the event. See the event listing for more details on how to sign up. We hope to see you there! 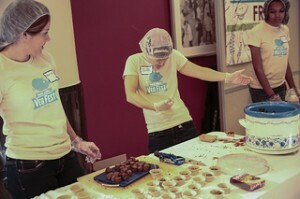 Sunday’s third annual Twin Cities Veg Fest was a lot of fun and a lot of work. As usual, I was nervous about the event. This is Compassionate Action for Animals’ largest event. Those of us who planned the event invested months of effort into it, and we want this event to go well for ourselves, but more importantly, for the animals on whose behalf we do this work! Well, my fears were (as usual) for naught. The event was a smashing success, with around 2,300 people coming to try delicious vegan food, learn more about animal issues, and celebrate compassion. We had a long line of people even before we opened, which was good because Minneapolis city council member Cam Gordon came by to read his Meatless Monday proclamation for Minneapolis. We’re so grateful to Cam for his support on this crucial campaign. Once we opened the doors, the flood started. Based on the number of bags we gave out, more than 500 people entered in the first hour alone. Needless to say, it was crowded, and there were lines for all the delicious samples and food to buy. I was particularly excited to try a new donut from Glam Doll Donuts. They had a maple bacon donut with vegan bacon from The Herbivorous Butcher. It was delicious. We’re excited to announce that we have a date for Twin Cities Veg Fest 2014! This year’s festival will take place on Sunday, September 28, 2014 from 10am-4pm. That’s right, this year we’re holding the festival on a Sunday. 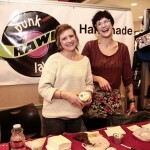 Like previous years, we’ll have lots of free food for you to try, fabulous food vendors, and compelling speakers. For this year, we’re also adding a day of cooking demos. Talented chefs will show you how to prepare all sorts of tasty, accessible, and healthy plant-based foods. Sponsoring the event is a great way to get the sponsor’s name or product in front of an interested audience. Last year’s event attracted approximately 2,000 people and this year we expect 2,500 or more attendees. If you know of any business or organization that would be interested in sponsoring, please let us know. Our exhibitor application is also open. Sign up now to guarantee yourself a table in the exhibit hall. Do you know of a restaurant, business, or nonprofit that you’d like to see at the festival? Encourage them to apply! Exhibiting is a great way for them to get their product or message out to thousands of attendees. We’ll also be hosting our Their Lives, Our Voices conference on the same weekend. This year’s TLOV will take place on Saturday, September 27. 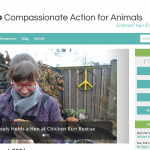 As you might have noticed, Compassionate Action for Animals has just launched a new website design. We think this site has a clean, simple design that will make it much easier for people to find the content they’re interested in. The new website software we’re using also makes it much easier for volunteers to edit and update the site, which makes us happy. We’d like to thank Brita Bengtson, Ashley Flitter, Jeff Johnson, Matt Mackall, and Jake Nath for their help while we worked on this site. We’d also like to thank Cali Mastny for helping us refine the design from our initial rough prototypes. We have migrated some of the content from our old site, but not all of it. We will transfer more content over in the future. If there’s something you’re really missing, please let us know so we can prioritize bringing to the new site. And of course, if you find broken links, images, or anything else broken, please tell us so we can fix it. Please consider leaving a gift for Compassionate Action for Animals. You can give farmed animals a very special gift by providing for Compassionate Action for Animals (CAA) through a bequest, trust, annuity, or insurance policy. Planned giving is a powerful way to ensure your longtime legacy of protecting animals while continuing CAA’s important mission into the future. Rice develops a golden crust in a cast iron pan next to a fired up griddle laden with sweet soy-marinated slices of homemade chinese five spice seitan. I can't believe I'm making my favorite Korean dish in my own kitchen and vegan. Sitting around the table with friends we devour the sizzling rice piled high with seasoned spinach, sesame bean sprouts, grilled seitan and a Korean chili paste. Between bites, we remark how the restaurant-worthy food entices even the most reluctant omnivore at the table. Best-selling vegan cookbook author Terry Hope Romero didn't lie – we can have it all and Vegan Eats World shows you how. In Vegan Eats World, the food philosophy Romero is known for shines: it's the plants not the animals that transport our senses when it comes to food. For her, the true building blocks of cuisines around the planet are the spices, herbs and grains. The recipes open with a section on spice blends, herb and spice-rich proteins and pickles before launching into your standard salads, soups, entrees, and desserts. Chapter 7 on dumplings, breads and pancakes could keep you busy and happy for days with steamed buns, momos and griddle breads. Vegan Eats World does an admirable job of making new dishes, ingredients and techniques accessible. Romero is informative, but enjoyable to read as she demystifies new ingredients like za'atar and pandan leaves which she organizes in "Kitchen Cartography" by ethnic region. When she inspires you to buy a wok, don't worry she'll walk you through how to season it to last. Diagrams illustrate some of the more complex tips, like how to fold a dumpling. All the recipes come with a key that includes flags for budget, time, soy-free, gluten-free, and good for new cooks. I made crepes for the first time because Romero's recipe was simple and her step-by-step instructions convinced me I could make them on cast iron without a crepe maker. 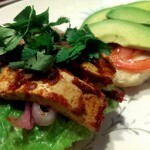 In all, the recipes in Vegan Eats World inspired me to not only cook, but to have people over and break bread together. It also encouraged me to explore the small ethnic groceries in my neighborhood for hidden treasures like gochuchang (Korean chili paste.) This is a great cookbook for the adventuresome or for the foodie who can't get enough of trying a new cuisine and wants to try to capture some of that magic at home. For more photos of recipes made from this cookbook, please visit Accidentally Meatless. 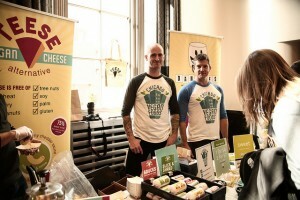 Thanks for making the second annual Twin Cities Veg Fest a tremendous success! The 2013 incarnation built on last year's inaugural event to share knowledge of where our food comes from, how to be a healthy vegetarian or vegan, and why being compassionate benefits everyone. Here's a rundown of the highlights. About 2000 people attended the festival this year, a two-thirds increase from last year. A steady stream (more like a torrent) filled the Great Hall in the University of Minnesota's Coffman Memorial Union throughout the morning and kept flowing the rest of the day. Early attendees were treated to swag bags loaded with goodies and coupons from Alternative Baking Company, Way Better Snacks, Tofurky, and many more! Inside the exhibitor hall, attendees had an overwhelming array of tasty vegan snacks to sample and dishes to scarf down, thanks to our wonderful food vendors. Samples included sausage from Field Roast, seitan from the folks at Upton's Naturals, marshmallows and cheese from Chicago Vegan Foods, and tortilla chips from Way Better Snacks. Oh yeah, we also had nut cheese from Punk Rawk Labs, Bee Free Honee, caramel confections from Comfort Candy, chocolate from Theo Chocolate, bulk snacks from Mississippi Market, Tofurky sausage, chocolate soy milk, Peace Coffee, and So Delicious ice cream sandwiches. That's a lot. It was all awesome. 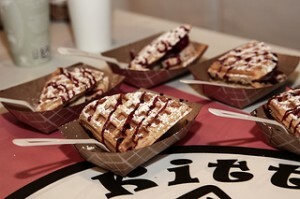 For the hungriest among us, four vendors offered up delicious food by the plateful. Asase Yaa had a dazzling variety of world cuisine, Kitty Corner Cafe loaded Turkish waffles with dark chocolate and fruit, Flamingo impressed with their Ethiopian dishes, and Seward Cafe served up their delicious vegan and gluten-free baked goods. 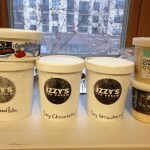 There was much rejoicing. Indeed, many who had never thought too seriously about vegan food expressed delight at the diversity and tastiness of all the samples. 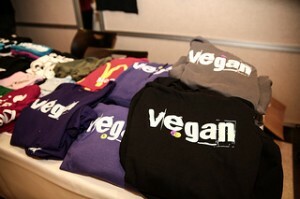 Many vegetarians and omnivores alike expressed a commitment to reduce or remove animal products from their diets. Yay! And yes, there were exhibitors who didn't serve food. Move2Veg advised attendees on plant-based nutrition, while Ethique Nouveau and Happy Animals sold a variety of animal-friendly goods. Heartland Farm Sanctuary, Minnesota Voters for Animal Protection, Chicken Run Rescue, and others showed Twin Cities Veg Festers how their actions can make a huge difference in the lives and well-being of animals. There's too many to list, so please check out the rest of our great exhibitors. Upstairs, we had presentations from five compelling speakers. Christine Coughlin, founder and President of Minnesota Voters for Animal Protection, spoke about the importance of political action to protect animals. Suzy Sorensen, owner of Move2Veg, provided introductory information on healthfully transitioning to a plant-based diet. Nathan Runkle, founder and Executive Director of Mercy for Animals, provided a glimpse into the hidden lives of farmed animals and the destructive impact of industrial animal agriculture. Nick Cooney of Farm Sanctuary highlighted ways we can be more effective advocates for animals. Our day of speakers concluded in the afternoon with a talk by Jeff Johnson, Assistant Professor of Philosophy at St. Catherine University, on the ethical arguments that inform our treatment of animals. The talks sparked useful conversations among attendees and piqued the interest of those unfamiliar with a more compassionate lifestyle. We also held a concert in the Whole in the Coffman basement. In Defence, Alison Scott, Sean Anonymous, and Sleepyhead entertained Festers looking to groove. Nearly all who attended, regardless of their current dietary choices, expressed overwhelming enthusiasm about the festival. We're happy to provide an environment where a diverse crowd can try new food, gain new information and perspectives, and learn about leading a more compassionate life. The second Twin Cities Veg Fest was better than we hoped and we're incredibly excited about making the event bigger and better next year! Please help us take action to prevent setbacks to animals welfare laws across the country, including MN, by calling Senator Amy Klobuchar and letting her know that provisions in the new Farm Bill are unacceptable. There perhaps has never been a more urgent need to call Senator Klobuchar. Right now, the House farm bill contains language that could nullify state laws protecting millions of animals from animal cruelty among other things. Written by Iowa Republican Congressman Steve King, it would put our laws banning puppy mills, horse slaughter, shark finning, dog meat sale, and gestation crates (and dozens more) all in jeopardy. The House and Senate versions of the farm bill are about to be combined via a Congressional conference committee. While the House version has the King language, the Senate version does not. It's key that we make sure the King segment is dropped prior to the final bill being approved. Please call Senator Klobuchar's office (she is on the conference committee) and leave a message urging her to strip the King provision from the farm bill. Her office number is 202-224-3244.